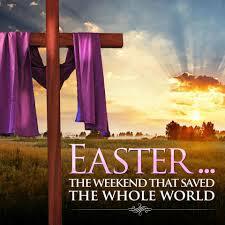 The main reason why I believe in Jesus Christ is because of this day – Resurrection Sunday. You see what separates Jesus from all other deities is not that He died (anyone can do that), but the fact that He rose. This is the day that proves Jesus is Lord! 42 It was Preparation Day (that is, the day before the Sabbath). 44 Pilate was surprised to hear that he was already dead. Summoning the centurion, he asked him if Jesus had already died. 45 When he learned from the centurion that it was so, he gave the body to Joseph. 46 So Joseph bought some linen cloth, took down the body, wrapped it in the linen, and placed it in a tomb cut out of rock. Then he rolled a stone against the entrance of the tomb. 47 Mary Magdalene and Mary the mother of Joseph saw where he was laid. Thank You Jesus For Good Friday! amen – he has risen indeed! Perhaps the saddest thing about the death of our savior – is that most of the crowd that applauded him, patted him on the back and welcomed him – were the same crowd that only a week later were shouting for his death – and that is just how fickle this world is so it’s best to keep our eyes, ears, hearts, and souls pointed to him right? God bless you this day!